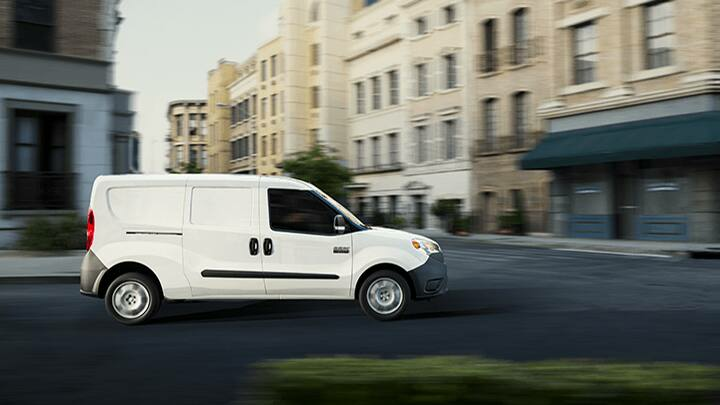 The 2015 Ram ProMaster City boasts a 1,883-pound payload and it can haul up to 131.7 cubic feet of cargo. Buyers who need to carry additional passengers can order a five-seater model dubbed ProMaster City Wagon. Both versions come in base and SLT trim levels. Expanding the scope of its commercial truck lineup, Ram has taken the wraps off of its new 2015 ProMaster City entry. As indicated in our original preview story, this new Class 1 rival to vehicles like the Ford Transit Connect and Nissan NV200 is based on the highly successful Fiat Doblo, a two-time International Van of the Year winner. To be offered in a 2-passenger Tradesman Van and 5-passenger Wagon configuration, the front-drive Ram ProMaster City has been strategically redesigned to make it more durable, comfortable, functional and cost-effective for buyers here in the U.S. market. The ProMaster City is available with a 2.4-liter Tigershark four-cylinder engine also used in the Dodge Dart, the Chrysler 200 and the Jeep Cherokee. The four-banger sends 174 horsepower and 178 lb-ft. of torque to the front wheels via a nine-speed automatic transmission, enough grunt to propel the van from zero to 60 mph in 9.8 seconds. Fuel economy figures will be published closer to the City's on-sale date. Inside, the ProMaster City offers a car-like cockpit with a three-spoke multi-function steering wheel, an analog instrument cluster and numerous storage bins. Select models can be ordered with a color touch screen that runs Dodge's Uconnect Access infotainment system. Cargo room is impressive, with more than 130 cubic feet of capacity behind the front seats. Six chassis-connected tie-down rings in the floor have a combined rating of 1,000 pounds with more than 48 inches of space between the fenderwells and 60 inches of width between the walls. On the safety front, the 2015 Ram ProMaster City comes with seven airbags and a sophisticated Electronic Stability Control suite that includes traction control, trailer-sway control, Hill-start Assist and anti-lock brake system (ABS), panic brake assist, brake-lock differential, roll mitigation, autonomous brake lamp activation and drift compensation. A ParkView backup camera and ParkSense assist system with audible warning are available as options. For more information on this vehicle, feel free to give us a call! Learn more about this model on the Official Ram ProMaster City Website.